We want you to be satisfied with everything you buy from us. If you are ever dissatisfied in any way, please contact us. We will replace any product or issue a refund, at your option, for one full year after your purchase. We guarantee any urn you buy from us will sell. If it remains unsold after one year, we will buy it back. If a product is defective, we will replace it (if possible) or issue a refund, at your option. We pay the shipping for returning a product to us, whether or not it is defective. 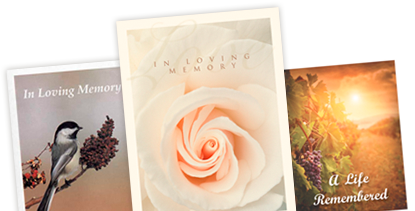 We would be happy to send you samples of individual designs, testing samples for you to run through your own laser printer or copier, or our complete sample book of memorial folders.